A very exciting and competitive season start to 2011 to say the least. Ok, complain that there was some predictability through the first street and road course races, in that, the first race through the streets of St. Petersburg was dominated by last year's championship winner, Dario Franchitti, and that the second race on the dedicated road course through the rolling landscape at Barber in Alabama was dominated by last year's inaugural Mario Andretti trophy for dominance in road and street courses, and 2011 Championship runner-up, Will Power but the level of competition and the mix of drivers and teams that have shown great promise have increased in this fourth year since American open-wheel racing became unified (and this last year of the old Dallara chassis). Take the third contest through the streets of Long Beach ... it was won by six seconds by someone who started the last Yellow Flag caution period in P6. Mike Conway ran and qualified fairly well most all weekend, but no one had anything for him at the end of the race where he conserved his car and unleashed it with about 17 laps to go to end with a dominating win. Qualifications had four of the top six spots filled with three former ChampCar Series drivers with Power - P1, Servia - P4 and Wilson - P5 ... and one European transferee from England, Mike Conway in P3. In the ICS Championship points race going into Round #4, we see a pattern developing because as it was in qualifications at Long Beach, four of the top six places are occupied by three former ChampCar Series drivers with Power - P2, Servia - P4 and Tagliani - P6 ... and one European transferee from England, Mike Conway in P5. Day one of Round #4 down in Brazil, this trend of competition in the old Dallara chassis, continues. Ryan Briscoe sets early fastest laps in the first practice session of the day at 01:25.1072 - 107.272mph. The top pacesetters followed with teammate Will Power - 01:25.1421 - 107.228mph - 0.0349 difference / Ryan Hunter-Reay / Helio Castroneves / Justin Wilson / Dario Franchitti round out the top six. Mike Conway, Round #3 winner at Long Beach ended up in the middle of the first session order in P12 at 01:25.7720 - 106.440mph at over a half-a-second off of the pace at 0.6648 behind. Round #4 second practice session yields a surprise fast lap by HVM driver, Swiss born Simona de Silvestro. She was able be the second fastest of the session behind Will Power (01:24.151 - 108.491, nearly a second faster than practice session #1) at 1:24.231. Scott Dixon / Ryan Hunter-Reay / Dario Franchitti / Helio Castroneves round out the top six. Knock out qualifications begin via live Timing & Scoring with the augmented IMS Radio Network call on indycar.com at 2 p.m. (ET). VERSUS' coverage begins at 6 p.m. (ET). Will Power earned his fourth consecutive PEAK Performance Pole Award of the season and gave Penske Racing its 200th Indy car pole in the Firestone Fast Six qualifying for theItaipava São Paulo Indy 300 presented by Nestle. Power, driving the No. 12 Verizon Team Penske car, set the track record of 1 minute, 1.8958 seconds with three minutes left in the 10-minute shootout on the 2.536-mile, 11-turn street circuit. 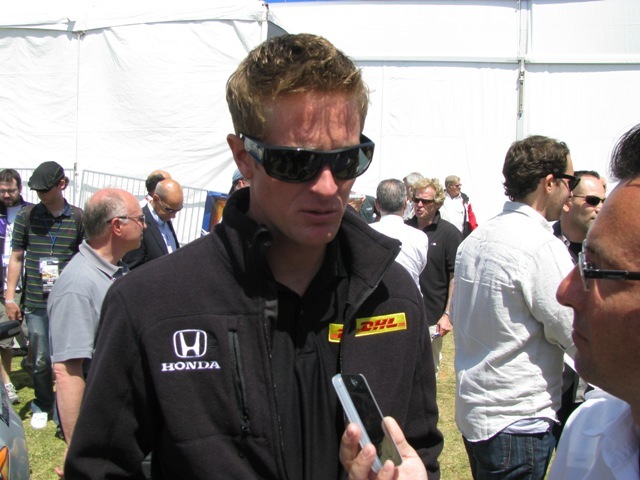 Like at Long Beach two weeks earlier, Ryan Hunter-Reay will join Power on the front row. 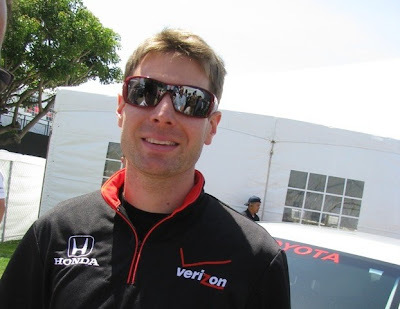 They finished 1-2 in the inuagural IZOD IndyCar Series race in Brazil, with Power starting the 2010 season with the victory. Scott Dixon and Ryan Briscoe will share Row 2, while Graham Rahal and Dario Franchitti will be on the third row for the 75-lap race (noon ET on VERSUS). It's the best start of the season for Rahal, driving the No. 38 car for Service Central Chip Ganassi Racing. Vitor Meira, who finished third in the 2010 race, missed advancing to Segment 2 by 0.0647 of a second – the third time this season (gaps of 0.0091 of a second at St. Petersburg and 0.1937 of a second at Long Beach). … Sebastien Bourdais, completing his initial road/street course stint of the season with Dale Coyne Racing, will start a season-high 12th in the No. 19 Boy Scouts of America car. … Eight different teams were represented in 12-car Segment 2. … James Hinchcliffe bumped Simona de Silvestro, who posted the second-quickest lap in practice, from advancing to Segment 2 on his final lap. ... and Mike Conway, the third different winner in as many races? ... he will be starting inside row 5 in P9, his best position of the weekend. The Andretti family and the Toyota Grand Prix Of Long Beach almost have a charge of destiny about them when spring comes around here in the Los Angeles basin. Mario Andretti showed an American face during the Formula 1 years and in 1977, at Long Beach, when he became the only American to win the United States Grand Prix West. He went on to win four times while driving for Newman/Haas in 1984, 1985, 1987, and 1988. Michael Andretti won at Long Beach as a driver for Kraco Racing in 1986, Newman/Haas in 2002, further owned/fielded the winning cars in 2010 (Hunter-Raey) and now ... 2011 (with Conway). Take for example this latest round of the 37th edition of a temporary street race that set the standard of bringing the track to the people as opposed to having the people travel to a dedicated track. Last year, Andretti Autosport, and Michael Andretti specifically, were very confident that they would have the car and driver to win the event. Ryan Hunter-Raey delivered on the pre-event near prediction at the Long Beach Motorsports Walk-Of-Fame by Michael that Ryan would win the race. This year looked as though the Andretti Autosport driver would repeat as Hunter-Raey had strong practice, qualifying sessions throughout the weekend, and running at the top of the order in second late in the race, behind Penske Racing's Ryan Briscoe ... only to have to retire with transmission problems with 13 laps left. Enter Mike Conway ... Conway claimed his first IndyCar Series race victory with a late charge despite tumbling down the order with an ugly first pitstop. Conway worked his way back through the field and on what turned out to be the last Yellow Flag restart of the race, he was sixth behind Briscoe leading fellow teammate Hunter-Reay, Franchitti, Alex Tagliani (Sam Schmidt), Hinchcliffe (Newman/Haas) as the green came out. Conway quickly passed Hinchcliff and Tagliani on Shoreline Drive at the restart, picked up another place when Hunter-Reay's car slowed with its gearbox problem, then was able to dispatch Franchitti and Briscoe in quick succession to take the lead. It turns out that Conway was able to keep his tires cleaner during the Yellow Flag caution period making the dirty tires of Franchitti and Briscoe open for clean and easy overtakes. Once ahead, Conway, on his clean tires, decisively stormed away from the field, going on to win by 6 seconds as Briscoe held off Franchitti for second. At the post race press conference, Michael Andretti, team owner of Andretti Autosport, expressed his confidence in not only adding Conway to his team but the future prospects of Mike Conway for the season. "I think Mike showed a lot of signs of brilliance last year at the beginning of the season and then unfortunately had his accident," Michael Andretti said. "Coming back, I had no question in my mind. I personally felt like he was going to be hungrier than ever, and that's exactly the way it came about." "I never felt like it was taking a chance. I was so happy that we were able to put a deal together with Mike because I wanted him all the way from the end of last year." "I was very happy because I felt like he was going to be a great addition to the team - not only as a great talent, but he just fits in with the other three drivers, which is quite important to have that chemistry." And I think we have a great chemistry right now between the drivers, and because of that, I feel really good about the rest of this year. I think we're going to be strong." Andretti did admit he wasn't expecting Conway to win the race, conceding that he was happy with the prospect of the Brit at being poised to finish in the top six on the last restart. "And then, all of a sudden, everybody starts cheering, and I'm thinking, 'What are they cheering about?' Mike is like, boom, going past Dario (Franchitti), and next thing you know he's past (Ryan) Briscoe. Unbelievable." 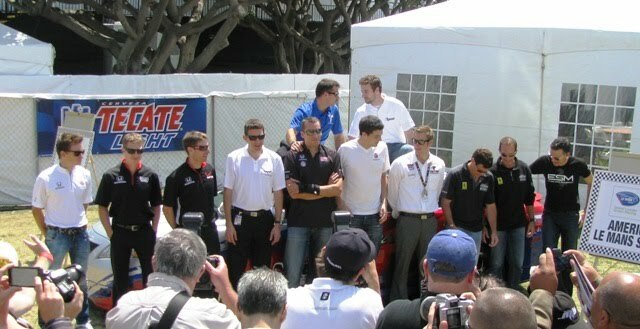 At the end of the press conference one felt that that this Andretti charge of destiny with Long Beach just might end up as a Three-Peat for Michael and his team come 2012 when the 38th Toyota Grand Prix Of Long Beach will be held once again when spring comes back around here in the Los Angeles basin. ALMS at Long Beach 2011 - 12 cyl. power gives new meaning to muscle at "Muscle Milk"
12 cylinder power gives a new meaning to the muscle at "Muscle Milk"
In qualifications, the lead for the start of the race changed eight times between the two fastest cars in the American Le Mans Series 2011 season and the only two cars in the LMP1 classification. At race start the race was ended with a first lap pass by the Muscle Milk Aston Martin driven by Lucas Luhr on the series points leading Dyson Racing Mazda/Lola driven by Chris Dyson. After a long caution period which started soon (lap #3) after the turn #6 pass for the lead, the lead never change as the Muscle of the 12 cylinder engine of the Aston Martin pulled ahead by nearly a lap before a race ending crash with about eight minutes left had the race end on a Yellow Flag while the field took the Checkered Flag in parade behind a safety car. Behind the two LMP1 class cars the story was very different, in that, the GT class was in a pitched battle in the first 31 laps as the Rahal Letterman Lanigan BMW's, the Corvette, and Patrick Long in the Flying Lizard factory Porsche duked it out while being as hooked-up as a train. Shortly after Luhr’s pass for the lead, attention turned to a furious GT battle led by Joey Hand in the BMW Team RLL BMW M3 GT. While leading the Porsche 911 GT3 RSR of Patrick Long and the Corvette Racing Chevrolet Corvette C6.R of Oliver Gavin, Hand was caught out by teammate Bill Auberlen, who spun in Turn 2 just before the 30-minute mark and blocked the course as the GT leaders came back around. Gavin seized the moment, promoting his Corvette into the lead on lap 44. GTC traffic came into play next when Long attempted to use one of the slower cars for a pick on Gavin in an attempt to take the lead 10 minutes later at Turn 7. Hand, who had fallen to third, anticipated the move and passed both Gavin and Long to move back into the GT lead. Long used the Porsche’s power to get back around Hand coming out of the final turn but that lead was short-lived. On lap 31 and after dispatching the Extreme Speed Motorsports Ferrari 458 Italia of Scott Sharp - which had just completed its first pit stop - Long made contact with the Turn 9 wall, damaging the suspension and sending the car to pit lane and an eventual retirement. Hand retook the lead, and a flawless pit stop for the BMW Team RLL ensured Dirk Mueller was in position to take the team’s second consecutive win. The full-course caution came out with less than eight minutes remaining in the race after two GTC Porsches made contact on the backstretch, leaving a car stranded at Turn Nine and a trail of fluid on the course. The No. 4 Corvette finished second in the hands Magnussen, who set a new GT race lap record of 1:20.552 . Third place went to the hard-charging Risi Competizione Ferrari F458 Italia driven by Toni Vilander and Jaime Melo. The team was forced to start the car from the back of the grid after an accident in qualifying prevented Melo from entering a flying lap. In LMPC, polesitter CORE autosport faced off against Intersport Racing. The pivotal moment came on lap 56 when Gunnar Jeannette’s ORECA FLM09 passed Kyle Marcelli for the lead in Turn 1. It was the first win for the new LMPC team and defending Cooper Tires Prototype Lites championship team but the second in a row at Long Beach for Jeannette. 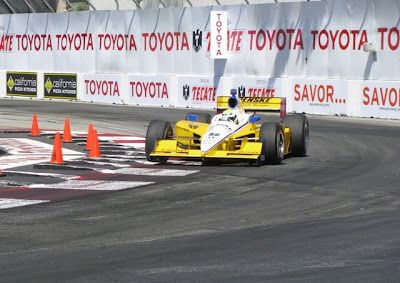 Finishing third overall with Ricardo Gonzalez, Jeannette also set a new LMPC race lap record at Long Beach, a 1:18.620. Completing the LMPC podium with Intersport’s Marcelli and Tomy Drissi were Eric Lux and Elton Julian in the Genoa Racing ORECA FLM09. Black Swan Racing, which had a rough debut at Long Beach last year, navigated the treacherous streets like veterans this year for its second straight GTC win of the season with Tim Pappas and Jeroen Bleekemolen behind the wheel of their Porsche 911 GT3 Cup entry. Level 5 Motorsports the LMP2 winner, though the team elected to park the Lola-Honda coupe piloted by Scott Tucker and Christophe Bouchut after 45 laps. MICHELIN® GREEN X® Challenge honors went to LMP1 winner Muscle Milk Aston Martin Racing and GT winner BMW Team RLL. The Tequila Patrón American Le Mans Series at Long Beach will be broadcast on ESPN2 from 5 to 7 p.m. ET on Sunday. Following the ESPN2 broadcast, the race will be available on demand at both ESPN3.com and americanlemans.com. The American Le Mans Series presented by Tequila Patrón will take its traditional break for those teams preparing to race at the 24 Hours of Le Mans and return for Round 3, the American Le Mans Northeast Grand Prix at Lime Rock Park, on July 9. The race will be shown live and in its entirety on ESPN3.com in the United States and internationally on americanlemans.com starting at 1:05 p.m. ET. ESPN2 will provide television coverage from 1 to 3 p.m. ET on Sunday, July 10. Long Beach street circuit, Long Beach, Calif.
1. (2) Lucas Luhr, Monte Carlo; Klaus Graf, Dornham; AMR/ Lola Coupe B08 62 (1, LMP1), 83. 2. (1) Chris Dyson, Pleasant Valley, NY; Guy Smith, Bracken, Yorkshire; Lola B09 86/Mazda (2, LMP1), 83. 3. (3) Ricardo Gonzalez, Monterrey; Gunnar Jeannette, Salt Lake City, UT; Oreca FLM09 (1, LMPC), 81. 4. (4) Tomy Drissi, Los Angeles, CA; Kyle Marcelli, Barrie, ON; Oreca FLM09 (2, LMPC), 81. 5. (7) Joey Hand, Sacramento, CA; Dirk Mueller, Monte Carlo; BMW M3 GT (1, GT), 81. 6. (8) Oliver Gavin, Yardley Hastings; Jan Magnussen, Roskilde; Chevrolet Corvette C6 ZR1 (2, GT), 81. 7. (28) Toni Vilander, Kankaanpaa; Jaime Melo, Milan; Ferrari F458 Italia (3, GT), 81. 8. (11) Wolf Henzler, Nuertingen; Bryan Sellers, Braselton, GA; Porsche 911 GT3 RSR (4, GT), 80. 9. (6) Eric Lux, Jacksonville, FL; Elton Julian, Santa Monica, CA; Oreca FLM09 (3, LMPC), 80. 10. (15) Tommy Milner, Leesburg, VA; Olivier Beretta, Monte Carlo; Chevrolet Corvette C6 ZR1 (5, GT), 80. 11. (17) Jon Bennett, Fort Mill, SC; Frankie Montecalvo, Highlands, NJ; Oreca FLM09 (4, LMPC), 79. 12. (16) Bruno Junqueira, Brazil; Cristiano da Matta, Belo, Horizonte; Jaguar XKR (6, GT), 79. 13. (9) Bill Auberlen, Redondo Beach, CA; Dirk Werner, Kissenbrück; BMW M3 GT (7, GT), 79. 14. (26) Seth Neiman, San Francisco, CA; Darren Law, Phoenix, AZ; Porsche 911 GT3 RSR (8, GT), 78. 15. (19) Tim Pappas, Boston, MA; Jeroen Bleekemolen, Monte Carlo, ; Porsche 911 GT3 Cup (1, GTC), 77. 16. (13) Ed Brown, Las Vegas, NV; Guy Cosmo, West Palm Beach, FL; Ferrari F458 Italia (9, GT), 77. 17. (20) Bill Sweedler, Westport, CT; Leh Keen, Dublin, GA; Porsche 911 GT3 Cup (2, GTC), 77. 18. (5) Miles Maroney, Topanga, CA; Alex Figge, Denver, CO; Oreca FLM09 (5, LMPC), 77. 19. (23) John Potter, Salt Lake City, UT; Craig Stanton, Long Beach, CA; Porsche 911 GT3 Cup (3, GTC), 76. 20. (21) Dominik Schwager, Eisenhofen; Nicky Pastorelli, Rijswijk; Lamborghini Gallardo LP560-4 (10, GT), 75. 21. (27) Scott Blackett, Avon, CO; Nick Ham, Evergreen, CO; Porsche 911 GT3 Cup (4, GTC), 71. 22. (12) Johannes van Overbeek, San Francisco, CA; Scott Sharp, Jupiter, FL; Ferrari F458 Italia (11, GT), 70. 23. (25) Brendan Gaughan, Las Vegas, NV; Dion von Moltke, Coral Gables, FL; Porsche 911 GT3 Cup (5, GTC), 70. 24. (14) Sascha Maassen, Lontzen; Bryce Miller, Summit, NJ; Porsche 911 GT3 RSR (12, GT), 68. 25. (29) Scott Tucker, Leawood, KS; Christophe Bouchut, Paris; Lola Honda (13, LMP2), 45. 26. (22) Duncan Ende, Los Angeles, CA; Spencer Pumpelly, Mason Neck, VA; Porsche 911 GT3 Cup (6, GTC), 36. 27. (10) Patrick Long, Bellaire, FL; Joerg Bergmeister, Langenfield; Porsche 911 GT3 RSR (14, GT), 31. 28. (18) Paul Gentilozzi, Grand Ledge, MI; PJ Jones, Torrance, CA; Jaguar XKR (15, GT), 2. 29. (24) Bret Curtis, Valencia, CA; James Sofronas, Newport Beach, CA; Porsche 911 GT3 Cup (7, GTC), 2. 30. (30) Luis Diaz, Mexico City; Scott Tucker, Leawood, KS; Lola Honda (8, LMP2), 0. 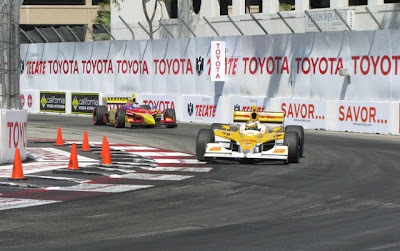 Another great race for the books and history that is the Toyota Grand Prix Of Long Beach event. Two open-wheel races (IZOD IndyCar and Firestone Indy Lights) and two full-bodied multiple class races (Tequila Patron American Le Mans Series and Pirelli World Challenge Championships) make for a very memorable modern era rite of spring here in Long Beach during its 37th year of hosting this motor culture event icon. It was a classic and perfect day to have qualifications on the track laid out on the streets of the Shoreline Village area adjacent to downtown Long Beach. The sun was out with a very light afternoon breeze with the temperature approaching the low eighties when each of the classes in the American Le Mans Series presented by Tequila Patrón (LMP1, LMPC, GT, and GTC) took to the track at the end of a day of preparation. One of the most dramatic duels just happened to be for top honors and P1 on the grid to start the race. Chris Dyson, owner and driver of the Dyson Racing Mazda-powered Lola coupe sponsored by G-Oil stated it best when he said, "You know, you need two cars to make a car race and let me tell ya' ... that it was touch and go." In the pits, Chris communicates with Guy Smith as he concentrates at getting the most out of his Mazda but he could not tell him that the lead changed between the Mazda that the Muscle Milk 12 cylinder Aston Martin ... yes, the other car in the LMP1 class ... eight times during the fifteen minute qualification session. LMPC - Gunnar Jeannette took pole position in LMP Challenge for CORE autosport, the first for the rookie ALMS team. His lap of 1:17.736 (91.139 mph) in the ORECA FLM09 that he will share with Ricardo Gonzalez was only 0.388 seconds quicker than Kyle Marcelli in Intersport Racing’s entry. He will team with Tomy Drissi. GT - Joey Hand’s remarkable season continued with his second career ALMS pole position and first at Long Beach. The Californian set a lap of 1:19.090 (89.579 mph) in the BMW M3 GT that he will pilot with Dirk Mueller for BMW Team RLL. Following up on a victory at the ALMS opener in Sebring and overall at the Daytona 24 Hours, Hand won a hard-fought session that saw the top four cars within 0.373 seconds. GTC - Jeroen Bleekemolen got his Long Beach pole position after a year of waiting with a lap of 1:23.179 (85.175 mph) for Black Swan Racing. The Dutch pilot broke Andy Lally’s qualifying record from last year by nearly a full second in the Porsche 911 GT3 Cup entry he will share with team owner Tim Pappas. BSR made its GTC debut at Long Beach last year, went on to win four times and claim the class championship. Bleekemolen was the fastest qualifier last year at Long Beach before the car was excluded in post-session inspections due to an improper fuel mixture. “We’ve come a long way since last year,” said the former LMP2 winner at Le Mans and Porsche Supercup champion. “We didn’t get the result we wanted here but our guys learned and took so many poles and wins after that. And they started with a win at Sebring this season. But we know it will be tough all year, just by looking at the times." 31. 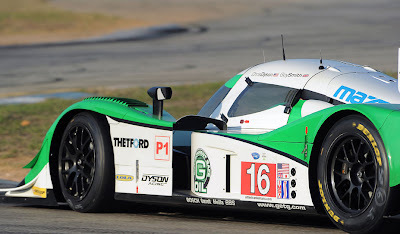 Luis Diaz, Mexico City (MX); Scott Tucker, Leawood, KS (US); Lola Honda (LMP2), No Time. This pole by the Mazda powered Dyson Racing Lola provided a much-needed lift for Mazda, which remains in shock following last month’s horrific earthquake and tsunami in Japan. As said Chris Dyson at the end of the Press Conference - "The people in the home country, the Mazda folks, they have come through an enormous ... enormous tragedy, and with enormous implications for their, for that country and we are honored to be able to deliver and at least enable them to have some light in what has been a very dark existence for a number of weeks. We hope that anything we do here will make them pleased and honored ... that we are part of it - we are definitely, have them in our minds and our hearts, throughout - since the whole thing happened." The Long Beach round will go live on ESPN3.com at 4:15 p.m. PT. Fans outside the U.S. can access live broadcasts through americanlemans.com, which also offers live timing and scoring throughout the weekend. The race will air on ESPN2 on Sunday, April 17, at 5 p.m. (ET). Visit the American Le Mans Series' schedule page for information on tickets and area accommodations. You can follow the Series on Twitter (almsnotes), on our Facebook page and the official YouTube channel. Long Beach Is Prepped! ... "Let's Get Ready To R(copyright)!" The annual race through the streets of Long Beach has always been characterized as a rough and tumble street fight between drivers and cars. So please excuse us if we are reminded of a man, standing at the middle of a ring, with a microphone in his hand, making a loud announcement and using the word RUMBLE! The picture just seems to fit the Toyota Grand Prix of Long Beach. From the E! style Toyota Pro/Celebrity Scion tCs battles, all of the way through Drifting exhibitions, the Pirelli World Challenge, the exotic Patron American Le Mans Series, to the open wheel excitement of IZOD IndyCar series racing rarely does a competition go down without a brutal contest and issues with a wall or another competitor. This what we come to expect from this rite of spring event here in the LA Basin - great weather, people lookin' racy and stylin' to the 9's, and tough time at the beginning of the race ... any race in turn #1! The talk from IndyCar drivers - specifically, Penske's Will Power (series points leader after 2 races), and Andretti Autosport's Ryan Hunter-Raey (defending Toyota Grand Prix of Long Beach champion) centered around the new rule for IndyCar restarts implemented this season ... double file on all starts during the entire race. 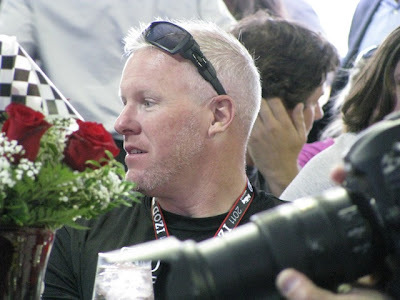 It was what was discussed most often during the TGPLB pre-event luncheon at the infield Tacate Lite Lounge yesterday. In previous years, only the first start of the race had two rows side-by-side going into the hard left turn #1 after screaming down the wide and fast Shoreline Drive, soft right-turn, front straight. Speeds could reach over 170 mph just to be braked down to under 60 mph under ideal conditions - no other cars on one's left or right. So, after any full-course YELLOW Flag, the re-start of the race will be just as hazardous and exciting as the first start of the race with no romm to fudge in the first few turns with everyone looking to gain positions. Then there comes the ability to pass at the track. The Patron American Le Mans race last year saw Adrian Fernandez in his Aston Martin get passed by Simon Pagenaud in his Acura in the last laps which always keeps the excitement high. With six minutes to go, the race looked to belong to Fernandez. With 50 seconds left, the pair crossed the start/finish line for the final time. By the time they reached Turn 1, Adrian had powered ahead by a sizable amount. Through 2,3 and 4, though, Simon was right on his tail again. As the two entered Turn 5, Fernandez made an uncharacteristic slip and when he ran wide, Pagenaud slid through and into the lead. It briefly appeared that Fernandez would take it back in 6,7, or even 8, but by the time they hit slower traffic at the hairpin, Simon was still ahead. Could that big V12 outdrag the ARX-01c on the final blast to the checkers? Not this time. Pagenaud held on, taking the win by just 0.353 seconds. The team is coming off a solid run at Sebring. How does that affect your confidence for the Long Beach race and for the season? It makes a huge difference for the season, to be honest. If there`s one lesson we`ve learned from our years in the ALMS, it is that you have to score week in and week out. Sebring is a bonus points event, so it`s critical to have a strong result. The team executed brilliantly all week at Sebring and that really sets the tone for the rest of the year. Midway through the event, I looked at the timing and scoring and we were running fourth overall with a car that was five seconds off the pace. I really chuckled at that, but it was no fluke. The faster cars were smashing into each other and going off into the tires, and our Mazda had just marched up the charts. Obviously, we couldn`t sustain it over the full race, but it did give us all some genuine pride in the quality of the team`s performance and strategy. You first ran Long Beach in 2005. Your thoughts on your very first lap of the track? I fell in love with Long Beach right away. It`s a great challenge. Most street circuits don`t really have long straightaways and good rhythm sections, but Long Beach is unique. Also, you really feel like you`re competing on a grand stage. The track is like a cavern slicing though a city, and the crowds are fantastic. The whole time it feels like you`re in a huge stadium. It`s an extra buzz and you find yourself digging deeper every lap. How much of an adjustment is there in a driver`s style going from the wide-open track at Sebring to the confines of a street race like Long Beach? You have to treat both tracks with equal respect. Sebring looks wide open but in reality there`s so little runoff, you can have a massive shunt before you even know what happened. Also, it`s the first race of the year and the last thing you want to do is jeopardize the team`s result in an enduro. Long Beach has Jersey barriers lining the track and that keeps you honest. You have to respect the limit at all times because Long Beach is entirely unforgiving. Blow the corner entry and pay the price. What is the best part of the Long Beach track? I really like the last section of corners before the Queen`s Hairpin. You come down the back straight and brake as late as you can, but you have to be careful of the bumps in the middle of the braking zone. Get greedy and your day will be over instantly. But if you get the entrance to that corner right, the car flows through the rest of the complex quite nicely. It`s a challenge every lap, and very important for lap time. Why does Long Beach posses such an iconic standing among street races? I think it`s mainly the venue itself and the great history of the event. 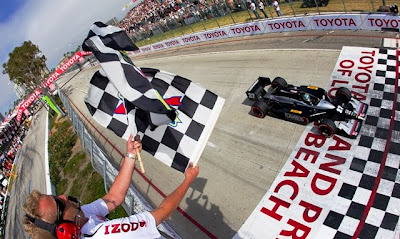 If you look at a transformative event in a city`s history, the LBGP is certainly one of the biggest game- changers for Long Beach. The fact that it has run without interruption for over thirty-five years is a staggering accomplishment for a street race. Most come and go after only a few years. The longevity and the importance of the SoCal market means it`s the "city" race that every team and sponsor wants to win the most. The importance of qualifying at Long Beach vs. other tracks? Qualifying is very important at Long Beach, but the nature of the track still allows for passing and this means it`s not the do-all and end-all. The polesitter hasn`t won the race every year we`ve been here, and that says something about the place. Is Long Beach more of a measured strategy compared to others on the ALMS calendar? It`s a tough one because it`s an unusual race distance. At two hours, it`s the shortest race on the calendar and it`s the first time we`ve run the race over 90 minutes here. This is going to raise some interesting strategic points because fuel economy will be just as big of a factor as outright performance and arguably more so. Once the flag drops, it`s up to Vince (Wood) and Peter (Weston) to navigate Guy and I to the front! Last year you were elected to the Road Race Drivers Club at Long Beach. A highlight of the year for you? It was really cool-- an honor-- to join the RRDC. I had been pestering my dad for years about joining this "secret society" and he and Bob Leitzinger always used to laugh about that. All joking aside, the highlight of my year was finding out that we were having a baby girl! What kind of flavor does a race weekend have when we share the track with IndyCar? It`s enhanced. The turnout is always very good and the same kind of fans who watch IndyCars like ALMS, and vice versa. It`s always great to see our friends from the IndyCars, several of whom have competed in ALMS the past few years. Usually, we share the venues at classic stops on our tours, so the crowds are really into it. The car ran flawlessly at Sebring. Talk a little bit about the advances that have been done to the Mazda MZR-R engine, the Lola chassis and the Dunlop tires in the offseason. Engine-wise, the team ended 2010 on a very strong footing. The second half of last season reflected all the hard work and development efforts that AER had put into the Mazda MZR-R engine. It`s the smallest engine on the track, but you`d never know that based on the Mazda turbo`s performance. This offseason, the engine team has concentrated on maximizing the power and torque curves based on the 2011 regulations, which are quite a bit different than last year`s and which were finalized quite late in the day. On the Lola chassis front, over the winter, we focused on starting the season with the narrower, 2011 rear wing and understanding the effects this would have on the balance of the car. There`s less downforce, so this has meant that we have had to reconsider the mechanical setup, including the springs and shock absorbers. We worked very hard in the testing to regain the balance and make the car happy on the tires, which thanks to Dunlop have taken another step forward. We had a pretty short timescale to come up with a race-able package, but as always the DRT engineering team gave us a great car in the race at Sebring. There`s definitely some more to come with the car, but we`ve hit the ground running. This is a home race for Mazda with their corporate headquarters nearby. How does the addition of their enthusiastic fans affect the team and drivers? The SoCal tuning crowd really has lots of love for Mazda, and the paddock is always mobbed around our cars. It`s amazing how passionate the Mazda owners are about the brand! A recent Motor Trend article called Dyson Racing the `greenest entry" in the ALMS with biodegradable oil, G-OIL and bio-fuel isobutanol. How does this green message fit in with your view on the direction of racing and the ALMS? It`s a great fit and really a matter of perfect timing that we happened to align ourselves with "green" thinking companies as the ALMS was truly beginning to embrace Green Racing. I couldn`t be prouder of our partners. It`s an honor to be aligned with such a forward-thinking group at G-OIL, who recognize the ALMS as a terrific platform to showcase their wonderful product in the most demanding racing conditions. Likewise Mazda, whose 2.0 liter MZR-R turbo engine is a core engine for their road car platform, has leveraged the value of the ALMS program as a direct connection to the their own, cutting-edge showroom products. And we have been able to give the world debut to the isobutanol fuel, which is revolutionary. How many other racing platforms allow for such a broad array of technological freedom and innovation? Racing needs to be fast, exciting and dramatic. But it can also contribute some genuine good to the world through innovation. The ALMS has given us the opportunity to showcase some incredible technologies and spread our partners` messages in a thrilling environment. This year’s race will be telecast by ESPN2 from 5 to 7 p.m. ET on Sunday, April 17. Live video and radio coverage will be available on americanlemans.com and ESPN3.com starting at 7:15 p.m. ET/4:15 p.m. local time. Visit the American Le Mans Series` schedule page for information on tickets and area accommodations. Motor Press Guild's April Meeting - Edsel Ford Wants This Bowl! 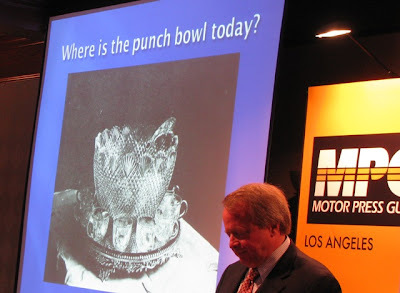 At the just concluded April luncheon of the Motor Press Guild, Edsel Ford, one of the great-grandchildren generation of the founding family of the Ford Motor Company, asked everyone in the room full of writers and broadcasters to find this punch bowl! This punch bowl was the trophy that Alexander Winton had hand-picked for his participation in a race won by Henry Ford. This was the first race Henry Ford had won and started Ford Racing 110 years ago. The race originally was scheduled to be a 25 lap race but was scaled down to a 10 lap race due to the fact that only seven teams were able to make it to the starting line. Henry Ford built a car that featured a 2 cylinder, 538 cubic inch displacement engine that developed 26 HP, named "Sweepstakes" ... custom made for the race. This bowl was sold at auction by the predecessor house to Sotheby's on October 17, 1951 without knowing its historic value to the Ford Racing legacy as the very first trophy won by Ford Racing and Edsel would like to bring it back home to display at The Henry Ford Museum. Audio of Edsel Ford telling the story of the first Ford Racing trophy and the plea to bring the punchbowl back! At the Media Day Luncheon, Pros and Celebrities mix with the Press as they draw for the specially prepared, Toyota Corporation, Scion tCs car they will drive in the charity race that is in its 35th year. After drawing their car, they then signed a special piece of art created by Raj Champaneri for an auction to be held at a charity event held during the 37th Annual Toyota Grand Prix of Long Beach event. Artist Raj Champaneri doesn't say much especially about his art and design work ... here are a few impressions he delivered at an interview while on location, recently. Raj says that he is blessed with a talent, that he has been touched to be able to provide such entertainment to all kinds of people, from children to adults, 'everyone has something to say'... "I am even more blessed that I can use my gifts for so much good; in preparing art and design work for charities creating an even greater good for all people, especially for children" (hence his connection with the Toyota Pro/Celebrity Race). His art work has generated a good sum of money for many various charities around the world, benefiting those in need. As the world’s longest-running and most prestigious celebrity racing event, the Toyota Pro/Celebrity Race has introduced more than 540 celebrities to the sport of race-car competition. Pitting popular personalities against professional racers, the 10-lap sprint around the 1.97-mile downtown Long Beach street circuit begins as an even field, as drivers get behind the wheel of identical race-ready Scion tCs. She normally reports on the Toyota Pro/Celebrity Race from her anchor’s seat in the “Good Day LA” studio, but this year JILLIAN BARBERIE REYNOLDS is switching gears and getting behind the wheel to take a shot at winning the grand prize. As co-host of the Emmy Award–winning, top-rated Fox morning show for the past 15 years, Reynolds created the much loved segments “Style File” and “Adopt a Pet.” In 2000, she added another show to her hosting résumé by joining “Fox NFL Sunday,” which she co-hosts each week during the NFL season alongside Terry Bradshaw, Howie Long and Jimmy Johnson. KIM COATES currently appears as mercurial motorcycle club sergeant-at-arms Tig Trager on the FX hit series “Sons of Anarchy.” His film career kicked off with a bang in 1991 with “The Last Boy Scout,” and he’s since starred in more than 40 films, including the Academy Award–winning “Black Hawk Down,” “Pearl Harbor,” “The Client” and “Open Range.” He has six films opening in 2011: “Goon,” “Sacrifice,” “A Little Help,” “Sinners and Saints,” “Robosapien” and “Blood the Butchers Tale.” Coates starred on Broadway as Stanley Kowalski in “A Streetcar Named Desire” and held the title role in “Macbeth” at the legendary Stratford Theatre. Returning from the 2010 Toyota Pro/Celebrity Race is popular actor BRIAN AUSTIN GREEN, who will vie this year in the pro category. Green most recently appeared as a recurring character on the ABC hit series “Desperate Housewives.” He gained overnight success for his role as David Silver on the teen phenomenon television series “Beverly Hills, 90210,” which ran for 10 years. Green also produced 40 episodes of the show. He was a series regular on Fox’s critically acclaimed “Terminator: The Sarah Connor Chronicles.” His additional TV credits include “Smallville,” “Las Vegas,” “Hope & Faith” and a lead role on “Freddie.” He directed his first feature film, “Fish Without a Bicycle,” in 2003. With his world-famous brothers, KEVIN JONAS has an impressive list of accomplishments, including 12 Teen Choice awards, numerous Grammy and Emmy award nominations, a No. 1 New York Times bestselling children’s book, the third-highest-grossing 3-D concert movie of all time and 2008’s No. 1 cable telecast, the Disney Channel original movie “Camp Rock.” The Jonas Brothers made SoundScan history as the only artist to hold three titles in the Top 10, with their third album, “A Little Bit Longer,” at No. 1; the “Camp Rock” soundtrack at No. 8; and their sophomore album, “Jonas Brothers,” at No. 10 on the Billboard Top 200. Their fourth album, “Lines, Vines and Trying Times,” debuted at No. 1 and was one of 2009’s top album debuts. STEPHEN MOYER plays vampire Bill Compton on HBO’s Golden Globe–nominated series “True Blood,” which will soon return for its fourth season. He’s recently completed filming “Ice,” “Tribes of October” and “The Caller,” and will soon begin work on “Big Valley.” He can be seen next on the big screen in “Priest,” alongside Paul Bettany and Cam Gigandet. Actor-turned-pro racer FRANKIE MUNIZ is returning for his fourth Toyota Pro/Celebrity race. Best known to fans as the eponymous star of the popular Fox series “Malcolm in the Middle,” Muniz put his acting career on hold after his win in the 2005 Toyota Pro/Celebrity race to pursue professional racing. He has also appeared in such films as “My Dog Skip,” “Agent Cody Banks,” “Big Fat Liar” and “Stay Alive.” He will next be seen on screen in the superhero comedy “Pizza Man,” not yet released. Vying for a win in the pro category alongside last year’s celebrity winner Green and star-turned-pro driver Muniz are KEN GUSHI, CHRIS RADO and KODY SWANSON. GUSHI, a drift car champion and member of the Scion Racing team, is the youngest drifting competitor in both the D1 Grand Prix of Japan and the Formula Drift Championships of the U.S.
RADO is the owner of WORLD Racing and one of the leaders of the professional compact drag racing circuit and, in 2009, was the first front-wheel-drive vehicle driver in history to run a six-second quarter mile. SWANSON is a midget-car series champion who began racing—and winning titles—before graduating from the eighth grade. MIKE SULLIVAN, owner of Toyota of Hollywood and Toyota of Santa Monica, is filling the Southern California Toyota dealer seat. Rounding out the field is the charity auction winner: JERRY WESTLUND, who is returning for the second consecutive year. He won the opportunity to race due to his generous donation in a charity auction. Toyota will donate $5,000 to Racing for Kids in the name of each celebrity racer and another $5,000 to the winning racer’s charity of choice. Additionally, a $15,000 donation will be made in conjunction with the 14th annual People Pole Award. Sponsored by People magazine, the award honors the pole-position winner of the Toyota Pro/Celebrity Race qualifying session on Friday, April 15. The Toyota Pro/Celebrity Race takes place the following day, Saturday, April 16. In addition to participating in a practice session and a qualifying race on April 15, the drivers’ schedules include a visit to Long Beach’s Memorial Miller Children’s Hospital, which receives a charitable donation in their names from Toyota. On behalf of the race and its participants, Toyota has donated more than $1.9 million to various children’s hospitals since 1991. Learn more about the Toyota Pro/Celebrity Race, one of six main-event attractions taking place during the 37th annual Toyota Grand Prix of Long Beach - HERE. One might assume that it would be difficult to have a conversation with one of the more accomplished, yet under-publicized motorsports drivers of our era ... American born (actually Southern California born and bred) factory Porsche driver, Patrick Long. Five minutes with Patrick Long leaves one with a strong and positive long-term memory of a person who is able to pursue & experience one's passion of mastering the art of driving an automobile in competition, establish strong interpersonal relationships at the pinnacle of performance, and make a difference in the context of this professional world on an international basis. All of this may sound daunting and hectic given the goals of winning and the demands of representing the technology and corporate agenda of an international sports car powerhouse that is Porsche, especially when one considers that Patrick remains the happy, relaxed yet focused and professional Southern Californian that he is, but to Patrick ... it is all part of a life lived fully and well. At the 2011 Toyota Grand Prix of Long Beach Pro/Celebrity Media Day, a day about one and half weeks before the event and where the celebrities are able to get familiar with the track lay-out for the first time as the city shuts down public access to the streets, Patrick Long joined his newest competition effort in the World Challenge for 2011. Patrick has joined forces with TruSpeed Motorsports (part of TruSpeed Motorcars, and TruSpeed Motorwerks - Porsche Sales, Service, and Racing out of Costa Mesa) in its desire to field a two car Porsche team in competing the Pirelli World Challenge Championship. TruSpeed is best known as the premier source for air-cooled Porsches in the United States. Founded by businessman and driver Rob Morgan in January of 2001, TruSpeed has delivered absolute satisfaction and superior service to more than 4,000 customers worldwide. Porsche, TruSpeed's founder and lead driver Rob Morgan, and TruSpeed's Motorsports Director, Tyler Tadevic are happy to have Patrick expand his competition awareness efforts outside of his primary Factory responsibilities of the American Le Mans Series and other corporate efforts ... as long as there remains no conflict on the Factory side. This TruSpeed Motorsports opportunity of teaming up with Rob Morgan fit the bill almost perfectly. Only one race, the Round 4 run at Miller Motorsports Park, Utah, would be effected with Patrick's absence. So far, Patrick has captured wins in Rounds 1 and 2 of the Pirelli World Challenge Championships from St. Petersberg ... and with 322 points, leads the driver championship by 89 points over the nearest competitor in the GT class. Since the American Le Mans Series presented by Tequila Patrón first raced at the historic Long Beach circuit in 2007, multiple victories have been hard to come by. Only one driver pairing in the last four seasons managed back-to-back class wins in the Tequila Patrón American Le Mans Series at Long Beach – Jörg Bergmeister and Patrick Long for Flying Lizard Motorsports and Porsche in 2009 and 2010. In addition, Corvette Racing’s Olivier Beretta and Oliver Gavin took GT1 victories in 2007 and 2009. The only other competitors to win more than once at Long Beach are David Brabham (2008 LMP2 and 2010 overall) and Simon Pagenaud (2009 and 2010 overall). There are 12 previous Long Beach class winners entered for next week’s race. In contrast 17 drivers will make their first Long Beach start in the Series. This year’s race will be telecast in its entirety on ESPN3.com starting at 7:15 p.m. ET/4:15 p.m. local time. ESPN2 will provide television coverage from 5 to 7 p.m. ET on Sunday, April 17. Visit the American Le Mans Series' schedule page for information on tickets and area accommodations. Come the weekend of the Toyota Grand Prix of Long Beach (April 14-17, 2011), Patrick Long will be very busy doing what he feels he was born to do ... driving and promoting the expansion of the relationships he shares in the Porsche motorsports community by looking to notch his third victory in class for the Flying Lizards factory Porsche team with teammate Jorg Bergmeister and competing in his first season in the World Challenge with TruSpeed Motorsports with his own Porsche along side of teammate Rob Morgan. Maybe, just maybe, he'll be able to win two Long Beach races during the same weekend in different series championships - if anyone can do it, Patrick Long can.